It’s easy to empathize with this perspective. This teacher has accepted a heavy responsibility. His feeling of duty pushes him to use his time teaching Jewish texts to transmit as much of his understanding of traditional Jewish culture as he can. The more time he spends helping students learn to make sense of the text independently, the less time he has to establish what he sees as a baseline cultural literacy. But when teachers reduce Jewish studies to this kind of transmission, they back students into a corner. Lacking the tools to make sense of the text on their own, students must either accept what their teacher tells them or reject it wholesale. McGowan, not particularly familiar with the story of Jonah, nor the long tradition of Christian exegesis that casts Jonah as a prefigurement of Jesus, chooses the latter. She brings it up, but only to mock it. For her, biblical stories serve to illustrate the absurdity of religious life. When we teach students to ask questions of the text, notice details, name ambiguities, compare and contrast different versions of the same story, and monitor their own reactions to a text, we offer them an escape from the binary of wholesale rejection or reaffirmation. We make clear that the tradition is not a static monolith that must be accepted blindly. Instead, we offer them a chance to join a living conversation that has lasted for millennia. As we set priorities for Jewish education, let’s not forget the most important resource of Jewish culture: the ability to read texts closely and make sense of them, and through them, the world in which we live. We may bemoan the fact that students might graduate from years of day school without knowing certain things. If all they have is a static body of knowledge they can neither understand nor apply, they won’t have learned very much at all. But if they learn to “read” Jewish texts, then should they end up on Colbert talking Torah, they’ll feel comfortable pulling out their Tanakh and looking at the text in an impromptu hevrutah. Ziva Hassenfeld is a post-doctoral fellow at the Mandel Center. Jonah Hassenfeld is the assistant director of teaching and learning at Gann Academy in Waltham, MA. 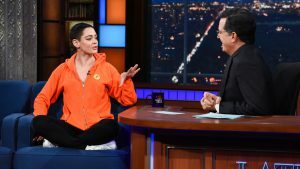 Photo: Scott Kowalchyk/CBS ©2018 CBS Broadcasting Inc. All Rights Reserved.